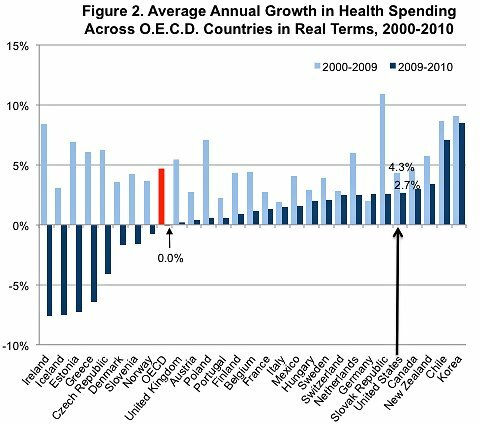 The New York Times article notes health care spending ceased growing in OECD countries, but not in the United States. The implication is single payer systems have better control, and are cheaper. but Canada's growth was not only higher than US growth in 2010, it was also greater from 2000-2009. "In 2010, health care spending stopped growing altogether across the member coun Growing tries of the Organization for Economic Cooperation and Development, according to a report released Thursday. From 2000 to 2009, total health spending grew by an average of about 5 percent each year in these developed countries, after adjusting for inflation. But in 2010, it ground to a halt, the organization said."